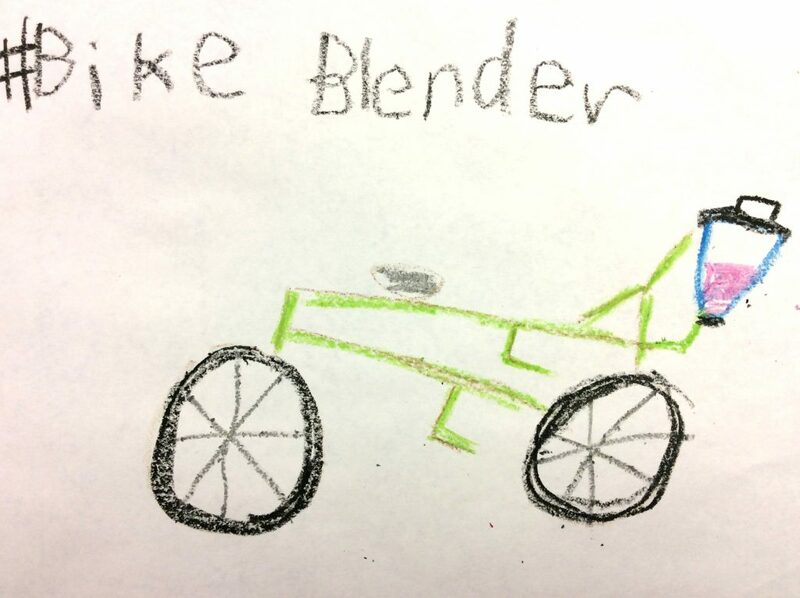 A doodle of the bike blender that went out during Give Where You Live. Community Partners traveled to Kearney Clinic and UNK’s [email protected] to give people a chance to ride Activate Buffalo County’s bike blender. The bike blender was built by the Bike Shed as part of the coalition’s Safe Routes to School program and is the ultimate combination of healthy eating and active living. It features a customized blender attached to the front of the bike that’s powered by the spinning of the front wheel. Everyone at Kearney Clinic had a blast hopping on the bike to make pedal-powered smoothies, and Community Partners staff took trays of smoothies around the organization to give everyone a chance to try the delicious and nutritious drinks. We also gave out recipe cards with super simple, delicious smoothie blends and information about what we do. At UNK, students were lining up to jump on the bike and give the blender a whirl. We could barely keep our mixes ready for everyone who wanted to make a smoothie! In addition, the ReThink Your Drink presentation was on display, along with an interactive drinking and driving simulation put on by CHI Health Good Samaritan’s trauma outreach team. The bike blender also traveled to NTV’s noon show with Activate Buffalo County Coordinator Holden Armstrong. He pedaled up a storm and shared some tips for using smoothies to get children to eat their colors. One tip is to combine vegetables like spinach or carrots with sweet fruits like strawberries, raspberries, or cherries. The events helped bring awareness to our organization and what we do and provided educational pieces to help spread our messages of healthier, safer living. Check out our YouTube page to see some videos of the bike blender in action!